REMINDER! TAYV Movie Night(s): Tonight - GREMLINS!!! Last week we protected the Nursing Home with Bubba Ho-Tep. But this week for TAYV Movie Nights in October, it's that moment a lot of you have been waiting for. REMINDER: TAYV Movie Night - October 10, 2013: Bubba Ho-Tep! 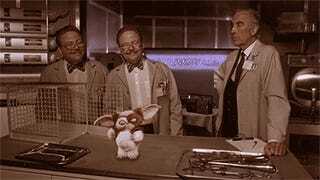 "You know spies... bunch of bit..."
Join us tomorrow tonight , Thursday October 17, 2013 at the AIM Chatroom for our discussion and fun as we watch _Gremlins _together. We'll eat food, sprinkle water on ourselves and be sure to meet up at 9 p.m. EDT. That's right, no one is allowed to eat or have a bath after midnight. As per usual, I'll be hanging out in the AIM chatroom at around 8:30 p.m. or so to add anyone to the chat who is interested. Just send a message to Zarnyx or Zarnyx Uriel and I'll see that you get added. I also keep TAY open as well so if for some reason you could not reach me there, feel free to shoot me a message over there too.